Molly Gaudry yanked me back from a depressing precipice. For the past three weeks I've been immersed in the world of Cormac McCarthy, climbing inside his mind via his newly opened archive at Texas State University to research his novel, Blood Meridian. The novel is famous for its poetic prose and unflinching violence, but there's a void of femininity in the novel. McCarthy's ubermacho gaze poses precarious questions for this female writer. If this is "genius," what am I? If this is "celebrated" writing, what is my writing? If this is a man's world, where do I fit in? Enter Molly Gaudry, introduced to me by a friend who recognizes the signs of the writer's downward spiral. 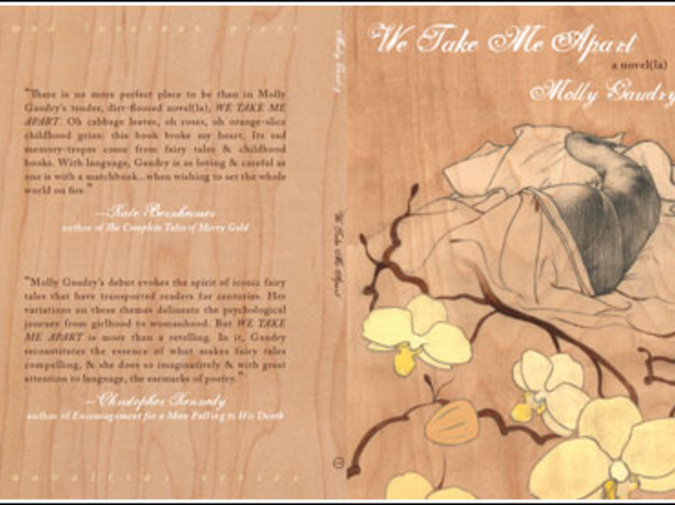 Molly's prose &mspace; steeped in poetry as much as McCarthy's &mspace; spirals upward, elevating and exploding. The creators and the destroyers, the beautiful and the gory, and the mythical and contemporary all thrive in balance. To read Molly Gaudry is to read Angela Carter's cutthroat narrative spoken through the hopelessly hopeful characters of Lydia Millet, all arranged in space with the care of an impressionist painter. Molly's world looks like the world I live in, a world that is simultaneously terrifying and enchanted. I wanted to chat with her about her peculiar balance of prose and poetry, starting with the way she's chosen to label her forthcoming work. Well, Molly, this may do it. You've described your forthcoming work, We Take Me Apart, as a "novella in verse." As if the evolution of digital literature couldn't quite put a stake in the heart of labels such as "short story," "short-short," "flash fiction," and, yes, "novella," you took the most hotly debated of these prose labels, "novella," and added "verse" to it. Now we have poetry and prose, length undetermined, labels shattered, literary anarchy. To open your manuscript, one might have to mutter, "I have no idea what to expect." You seem to enjoy grabbing the reader by the throat before she even reads your work. Your titles beg closer inspection. Your opening images startle and retreat, like a bogeyman, and one must wait for them to pop up again (and they do, framed in a concrete world that makes them even more horrifying). Now you're grabbing the reader with your genre label, eliciting a "Whaaaaaat?" before he can make the purchase. In crafting theme, image, narration, verse, title, form, page spacing, you leave nothing to chance when reaching out to your reader. Tell us how you came to understand the importance of locking each of these elements together. Hi Amy, I want to thank you, first of all for taking the time to conduct this interview and also for your sharp observation and comparison between my work and Lydia Millet's. Her narrator's "hopelessly hopeful" awareness, in the novel My Happy Life, was in fact the inspiration for my speaker/narrator's. I've read that book so many times my copy has cracks in its spine. When I think of the power of language, I recall her narrator's simple phrase — "Excuse me" — and how its meaning continually shape-shifts and evolves until the novel's conclusion; in its every utterance, absolute heartbreak for the reader. That the narrator doesn't experience the same heartbreak is literary genius. I'm compelled to borrow William Kennedy's famous statement about Garcia Marquez's One Hundred Years of Solitude — that it should be "required reading for the entire human race" — but I would apply it to Ms. Millet's My Happy Life. She achieved something extraordinary with that novel, truly. Yet, before My Happy Life, there is no greater influence on We Take Me Apart than Gertrude Stein'sTender Buttons. To experience that text is to be confronted with words, the multiplicity of meanings. It is brilliant and befuddling, both readable and not. The very first line, which functions as a heading, is "A CARAFE, THAT IS A BLIND GLASS." Thanks to these and all the other words in Tender Buttons, I ended up with a blind narrator who at one point imagines herself to be a dusty, forgotten carafe, and who opens the novella with the lines: "long ago / in a different version / it was not a glass slipper but a glass dress." The redefinitions of Gertrude Stein's "OBJECTS" and the recasting of key objects from a number of fairy tales led me to the major theme of this project: happily ever after (Lydia Millet style). Additionally, Kate Bernheimer's The Complete Tales of Ketzia Gold and The Complete Tales of Merry Gold provided me with gentle encouragement when I needed it. Because her novels exist, I didn't worry about working with fairy tales; because they were published, I didn't worry about form and structure. To Millet, Stein, and Bernheimer (and Carter, too), I owe a great debt. Without them, I might never have thought it okay to proceed with this unrecognizably categorizable manuscript. You mentioned Gertrude Stein, and that struck a chord because her work elicits a struggle for me. In graduate school, an instructor of mine who was keen to pitch me into the deep end of prose assigned her novel How to Write, which some have called "unreadable." The instructor required me to memorize the first five pages. I'm sure, for me, this was a task that elevated my ability to struggle with all sorts of difficult texts. Of course, that struggle resulted in a mental demolition in the approach to my own writing. It was quite liberating. Is there such a time in your writing life when a struggle with a particular text led to a break-though in your artistry? Is there a text you still consider intriguing and unreadable, yet alluring as well? Your white whale of words, so to speak? I think the memorization of five pages of something like that is utter insanity. Did everyone have to recite them in class? No. It was a privately inflicted torture designed just for me. Low residency programs will do that. Well, there was a time when I thought Richard Russo and John Irving (and Dickens) were gods — that long, overstuffed narrative exposition was entirely where it was at. I tried to write like those guys throughout my undergraduate and M.A. years. But then I graduated and discovered Blake Butler's story in Ninth Letter, "The Gown from Mother's Stomach," went to his blog, discovered online writing, small presses, venues for innovative writing, writers like Millet and Bernheimer, discovered an entire world of publishing that didn't give a hoot about the mainstream. I discovered a love of reading short, concise forms — flash fiction and prose poems. I hacked my previous writing to bits, culled the tightest, stand-alone sections, hacked away at them some more, and then suddenly I was publishing. These discoveries led to my breakthrough, surely. As for intriguing, unreadable texts, I'm still trying to get through everything Italo Calvino ever wrote that isn't The Baron in the Trees. I'm trying Virginia Woolf's Orlando. Julio Cortazar's Hopscotch.Giovanni Verga's I Malavoglia. Anything Sebald. Basically, everything I was assigned to read for a year-long modernism course (fall quarter, pre-modern; winter quarter, modern; spring quarter, post-modern). It was an undergraduate course, but studying with that professor, Maria Romagnoli, opened me up to really loving to read, to trying to understand literature. I should admit, too, that I really ought to brush up on my Joyce and Beckett. Some of their more well-known works I've yet to crack. Shame on me. I know. But my ultimate white whale is Salman Rushdie's Midnight's Children — not because I can't get through it, but because it's so incredible (I had to read it for a postmodernism course, a course on diasporic traditions, a contemporary fiction course, the list goes on). That book, I feel, is so important, necessary. I want to do that, but in a different way. I've tried to read Midnight's Children at least five times. It sits on my shelf sideways, swimming like a trout upstream against Karen Russell's St. Lucy's Home for Girls Raised by Wolves. This is where you set up the past and present using food items, and you are able to return to that later in the manuscript as a shorthand of sorts to signal a temporal shift in attention. Tell me about the process of discovering that device, how you worked with it in earlier drafts to manipulate time — or if it came naturally to you. Every food item in We Take Me Apart comes from Tender Buttons. In systematically borrowing and making lists of words from that text, I wound up with a lot of food I didn't quite know what to do with. Actually, this is a difficult question to answer; the manuscript saw so many drafts I honestly can't recall how this device came about. All I know is I had these lists of words from Tender Buttons, and I made myself write stand-alone chapters using each of those lists. And I remember, over and over again, there was all this food. Some of it I was able to incorporate in narrative, like the winter/bread chapter, and the vegetables on the wall, but there was still such an excess. So maybe it began as a shortcut — incorporating the food-as-time-marker. In the end, though, many of those markers were cut, and quite a few were shifted, in order to fine-tune and direct attention to the why-is-she-telling-her-story-now. Tell me about "the stitching years" sequences. When your narrator makes dresses out of flowers, you play with words with such a sense of delight. Flowers, after all, are meant to attract, and the fact that the narrator finds this obvious and some of her clients find it a poor choice of dress material. This might have been the place in the manuscript where I knew that Lydia Millet's My Happy Life was a major influence. A narrator who sees the world as beautiful and enchanted when others behave violently and aggressively bursts wide open in these "stitching years" passages. But, your narrator is a bit more functional than Millet's: we have a narrator with an perspective on the world counter to mainstream thinking who isactively engaged in the creation of things. The terms "stitching years" and "stitching hours" (I think the latter was cut from the final version) were always in the manuscript. In fact, in the beginning, they were used to mark the chronology of the flashbacks. Odd, how I've just recalled this. As for the flower parts chapter, it was a later addition. The manuscript needed a bit more bulk. I was sitting in my local coffee shop with a list of words fromTender Buttons, and I had the Internet and the results from a Google search for "flower parts." I can't recall where the idea came from for dresses made from flowers. I had the stitched-up, broken-necked flowers long before I had the dresses, and I'm sure this led to the idea. It is interesting, what you say about mine being a narrator "who is actively engaged in the creation of things." Something that never made it into the manuscript was her desire for children. I wish I could have found a way to incorporate this storyline, but it just never seemed right. Perhaps the invention and creation of the dresses filled that void. To me, the "stitching years" passages bear a heavy metaphorical connection to pregnancy. I thought these passages were influenced by Elizabeth Graver's short story, "The Mourning Door," (Best American Short Stories series, 2001) in which a woman stitches a baby together from found infant body parts. It sounds gruesome, but the story closely matches the experience of pregnancy. Doctors and pregnancy books will tell women things like, "By now your baby has a heart, and a liver, and half a spleen. Next month, you'll be finished making the brain." So, a story about stitching a baby together makes sense. And that's what I assumed your narrator was doing in a detached way, since she has such a skewed perspective of her surroundings. To be clear, I'm not saying your narrator's dresses were literally children, but that the dresses were her children in the sense of her creating body-shaped items from live material. Plus, flower parts are insanely sexual words. This may be the part of the interview where you say, "Uh, I totally didn't mean that." Is it a strange feeling to release your work to the public for their own interpretations? Oh wow, I do remember that story — what a great year that was for BASS. And "body-shaped items from live material" is something to think about; what an image you've provided! All right, so I was definitely aware of the sexual overtones in terms of the language surrounding the flowers and their parts. The repetition of the line "we are more than our parts" is, I hope, a key focal point; and I very much like your reading of that chapter, those dresses. I would say, then, that it's not at all a strange feeling for my work to be out there, open to others' interpretations; rather, it is a wonderful feeling. I'm grateful to you for giving it any attention at all, really. It's humbling, to think that my little book would provide a reader with the room to interpret. Again, I am grateful. Cormac McCarthy said, "The ugly fact is that books are made out of books. The novel depends for its life on the novels that have been written." (New York Times, 1992) After all the influencing, borrowing, listing, and stitching from other books that we've discussed here, do you think that these writerly acts are "ugly"? There is nothing ugly about the life of a novel, no matter who or what its literary predecessors. For instance, Shane Jones's novel, Light Boxes, was most certainly influenced by Garcia Marquez's One Hundred Years of Solitude, Calvino's The Baron in the Trees, Brautigan's In Watermelon Sugar, and Plasencia's The People of Paper. And it is all the richer and more beautiful for it. That a reader familiar with those books can recognize the author's allusions to them, is, for me, anyway, part of the joy of reading in the first place. Amy Minton is a graduate of the Warren Wilson MFA Program for Writers, and her writing appears in Best of the Web 2008, Hobart, Pindledeboz, Dewclaw, Dogzplot, and elsewhere. She is a mother, a wife, a petting zoo warden, and hot tea sipper. Molly Gaudry is a graduate of the University of Cincinnati's MA Fiction program, and her writing appears in Best of the Web 2009, PANK, Drunken Boat, Night Train, anderbo, and elsewhere. She editsWillows Wept Review, co-edits Twelve Stories, and is an associate editor for Keyhole Magazine. Find her online at mollygaudry.blogspot.com.